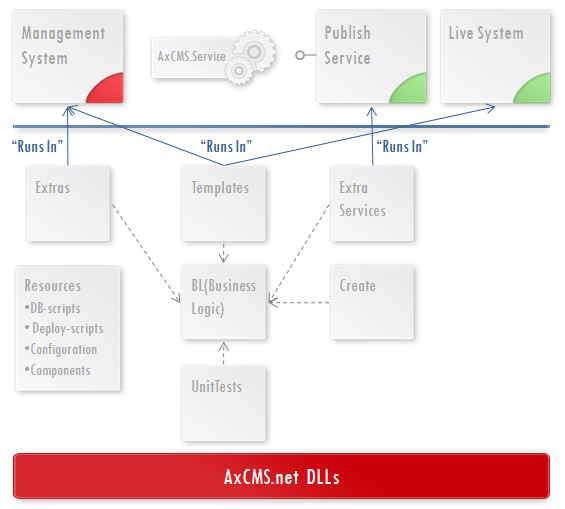 Although you are free to apply any Software Development Process with AxCMS.net, there are some typical issues and best practices, which are described in this chapter. It shows that you get something from Axinom ("AxCMS.net"), build the application on top of it (here called "Customer Solution") and let the Editors fill the content. Even if Axinom provides you a lot of templates and samples, the Customer Solution is what you build, you deploy and you run for your customer. We will examine below the structure of the Customer Solution in more details. First let's have a look at the products and services delivered by Axinom. As you see, you can choose between different versions of AxCMS.net. Some of them are available for everyone (major releases). 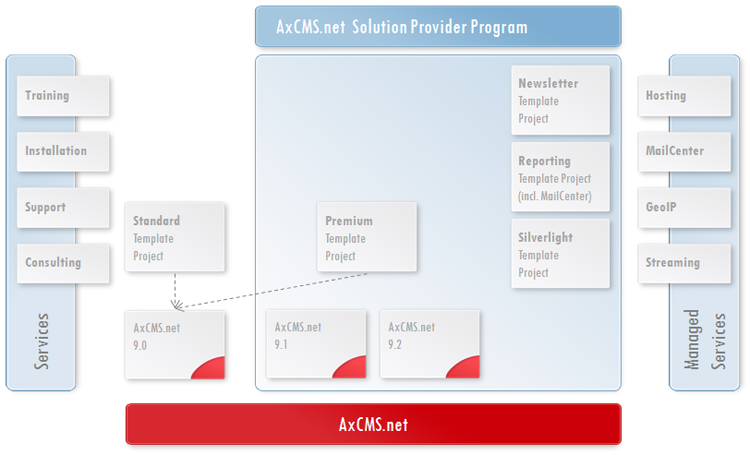 Intermediate releases are only available for AxCMS.net Solution Providers. 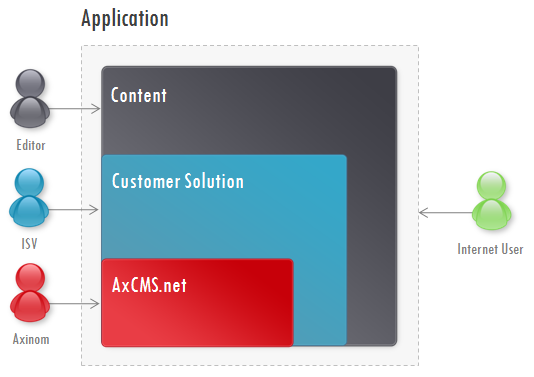 AxCMS.net Core is strictly speaking the only thing you need to develop your solution. To simplify your development Axinom provides different samples (called "Template Projects") demonstrating different sets of functionality and enabling you to start faster. One of them - Standard Template Proejct - is delivered for free for everyone and the others are only available for Solution Providers for additional price. It has the most common features used in virtually every web project. Premium Template Project - advanced szenarios for a general purpose web site (multisite, different layouts, templates, navigation), multilanguage, etc. Newsletter Template Project - contains the MailCenter and a sample solution illustrating the usage of newsletter, mail templates, subscriptions, tracking, etc. Reporting Template Project - logging and analysing actions. An ETL tool to extract data and put into OLAP cube. Business Analysing solution including definition of the cube and a template in Excel with most used reports. Each Template Project is compiled against a certain AxCMS.net version and is packaged together with this version. So if you download Standard Template Project you get automatically also AxCMS.net 9.0. Standard Template Project and Premium Template Project additionally have an installer. This installer is able to install AxCMS.net with the template project in the Development environment to the local workstation. The installer is not intended to be used in production environment, also not on the end-user workstation. In our process we always use two environments: development and production. 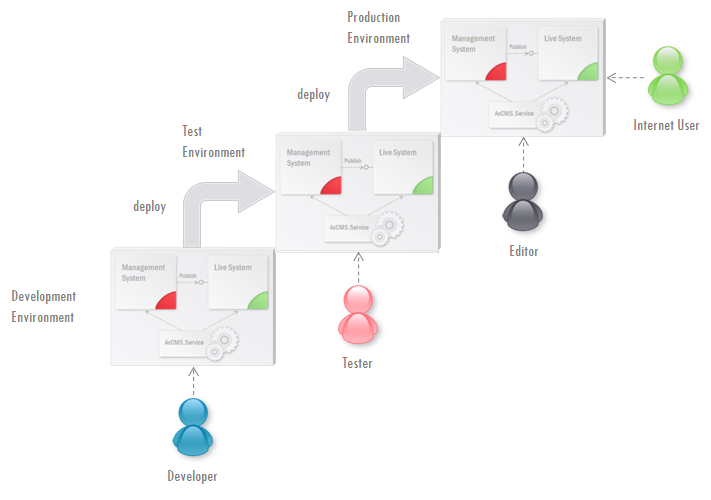 The application is first developed (in the development environment) and then deployed into production, where the end users use it (and the editors add content). For testing / integration purpose additional environment (test environment) can be used (or even more environments in complex szenarios).